"This easy money I'm earning on the side is really cramping my style!" — said no one ever. A small, supplemental income that's not too taxing on your time and energy can mean the difference between frugal and comfortable living. Trying to grow your savings? Stuck with a salary freeze? Too pinched to pull the trigger on that weekend getaway? Here are eight low-commitment gigs you can go after outside your nine-to-five to pad your pockets or indulge your leisure. You're probably not surprised by this stat: 81% of small and medium-sized businesses use social media to drive growth. But believe it or not, the Internet, with all its intricacies, is still a foreign place for many folks out there — including business owners. And while the majority of them are onboard with the social media marketing revolution, a solid 20% are still missing out. If you're savvy on Facebook, Twitter, Instagram, Pinterest — whatever networking tool might best add value and buzz to your local coffee shop's brand — set up a meeting with the owner and pitch your talents. This goes for the pizza shop, yoga studio, and laundromat on the corner, too. Those of us who live out our digital lives on these networks know them best. And we know how to use them to grow a brand or customer base because we've experienced first hand what works and what flops. No marketing degree required. If you've got a car and clean driving record, you can offer rides for a fee to people in your community who need a lift by using web-based services like Lyft and Uber. For example, you can offer to drive a stranger to their cousin's birthday party across town for $8. You get to choose how much your time is worth. With Amazon's Mechanical Turk, all you need is Internet access to make money from the comfort of your couch by completing tasks like writing product descriptions or identifying animal species in photographs. Many of the tasks take minutes to complete, which is both a bonus and drawback. You typically have to complete numerous tasks to earn any sizable income. Another website that will allow you to complete small tasks for a fee is Fiverr. You can complete tasks in areas like online marketing and foreign language translation for modest sums akin to $5. Examples of services currently being offered for $5 on Fiverr include writing a testimonial for a your business and creating an original Mother's Day rap. You'll rake in the big bucks with college prep tutoring, but you can still make good money teaching if you don't know the ins-and-outs of the SAT with many online tutoring opportunities. Lots of kids (and adults) need help in math, science, writing, foreign languages, and the arts. And if you're not comfortable teaching academics, you can still make money teaching skills you are comfortable sharing. Do you play an instrument? Can you sew, knit, or crochet? Are you a master computer programmer? Can you teach prospective vegans how to prepare meals? Would you make a killer tennis instructor? Do you know how to write a great cover letter or design a sharp resume? Brainstorm your skills. Now go out and find your students. They're out there. And there are coffee house bulletin boards, digital community boards like PebbleBox, and social media networks to help you spread the word about your services. TaskRabbit is a web-based service that helps match people looking to make some some extra cash with people nearby who are willing to pay to cross a few more items off the to-do list. By becoming a bonafide TaskRabbit, you'll have access to an array of local gigs ranging from running errands at the grocery store to more skilled labor like patching up a deflated bicycle tire. Not only will you be raking in the dough, you'll also have the satisfaction of knowing you helped out a neighbor in need. Websites like DogWalker.com exist solely to pair dog owners with people willing to walk their four-legged family members when they can't be around do it themselves. 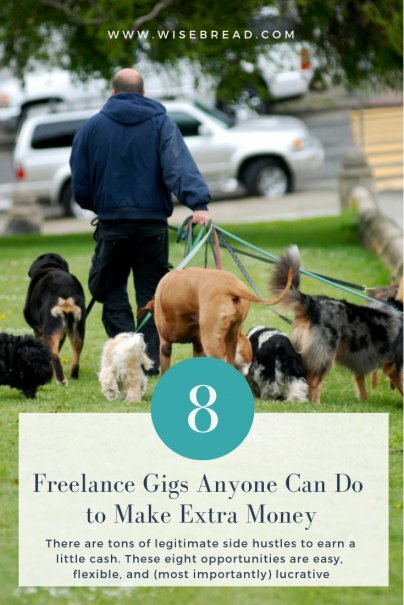 Not only can you use online dog walking job boards to scour databases of gigs near you, you can also list yourself as a willing-and-able dog walker on the prowl for furry clients. It'll cost you less than $1 to list your services in up to 25 zip codes using DogWalker.com. Other sites worth checking out include Care.com and sittercity. Technology has altered the way we do many things, but we're not yet in an age where a robot can sufficiently look after a child. The babysitter is still in style, and there are lots of cool websites like the aforementioned sittercity and Care.com to help you find clients. It might feel a bit like a flashback to your 16-year-old self, but the truth is this: Parents will pay good money to know their children are in good hands. And, thankfully, you're no longer your 16-year-old self. You're a responsible (we hope), reliable adult. You now know what to do when the four-year-old wets the bed. And you know lots of people with children. So don't be shy; every parent needs a break. Warm-weather festivals, fairs, markets, and concert venues need temporary employees to do work ranging from marketing and ticket sales to parking lot and aisle attending. They also need crafters, musicians, photographers, and other artistic folks to make these events worthwhile. Be proactive and search for the organizers of popular seasonal or one-time events coming to your area. Reach out and offer your services. Whether you choose to chase one of these eight freelance jobs, there's a habit every side-job seeker should adopt: Troll your local job boards with regularity. Coffee house bulletin boards as well as digital ones like Craigslist are oft-overlooked gold mines for well-paying gigs. You won't know what you'll find 'til you look. How have you made extra money on the side? Please share in comments!